Condition: New. Unpunched, cards in shrink. Notes on this game: I bought this thinking it was an expansion to the base game but it's basically a little different. 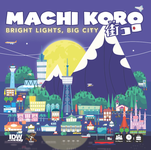 If you don't own Machi Koro then this is for you because it has much of what you would need for a great game.